Overview - The Spider-Man motion pictures are available for the first time ever in pure 1080p High-Definition, exclusively on Blu-ray Disc! See each heart-pounding adventure as you've never seen or heard before -- from Green Goblin's gleaming rider and Doc Ock's polished metallic tentacles in Spider-Man and Spider-Man 2 to Sandman's mesmerizing transformation and Venom's menacing inky black suit in Spider-Man 3. The master-quality audio will make you feel like youare in the middle of all the action! If there's one good thing to come out of Hollywood's love affair with film franchises, it's that now, even before a movie proves itself to be a blockbuster, usually the cast and filmmakers have already been contractually locked in for later sequels. That means that the guy you fell in love with playing Spider-Man in the first movie is almost certain to be the same guy you'll see in Part III. Likewise, the behind-the-scenes talent is also often in it for the long haul, giving many of today's biggest franchises a unified consistency of tone, approach and performance that's quite unique to recent cinema. Maybe that's why I find a franchise like 'Spider-Man' more compelling than, say, those old Batman films of the late '80s and early '90s. Instead of a series of patchwork sequels featuring a bunch of different guys in a Batsuit, guided by a bunch of different directors (each with seemingly contradictory visions), with 'Spider-Man,' much of the creative team has been on board since day one. It's always Sam Raimi behind the camera. It's always Tobey Maguire in the Spidey costume. And even the supporting characters and subplots have been constructed with care and attention to an eventual trilogy in mind. That makes all three 'Spider-Man' films feel less like a bunch of strung-together episodes, and more like one cohesive, six-odd-hour motion picture with three well-designed and perfectly-proportioned acts. Much of the credit for the success of the films belongs, of course, to Sam Raimi. Arriving on the scene in 1981 with his classic cult-horror film 'The Evil Dead,' over the course of the next twenty years Raimi continued to hone his craft as a filmmaker to the point where by the time he landed 2002's 'Spider-Man,' he wasn't just a cult director who got lucky, but rather an accomplished filmmaker who at last found the project he'd been preparing to make all along. The first film was the perfect commercial marriage between a piece of iconic, classic comic book pulp and a filmmaker with a wholly unique visual sensibility tailor-made for the material. Even more importantly, Raimi clearly had a passion for the character that transcended the obviously engineered, audience-pleasing elements of what was clearly meant to be a "franchise starter" of a picture. This was so much the case that, when 'Spider-Man' ultimately went on to gross nearly a billion dollars worldwide, it didn't seem like a cynical victory of marketing over substance but instead a triumph of genuinely earnest, populist moviemaking. Since there is likely no one reading this who doesn't already know who Spider-Man is, I won't bore you with a plot recap of the trilogy. Instead, I'll just praise Raimi and his stable of screenwriters for the thoughtfulness of their narrative construction. What's rare about the 'Spider-Man' trilogy is that each installment works as a self-contained adventure, but is even more emotionally resonant when taken as a whole. Raimi and company set up a strong cast of characters in the first film, gave them coherent arcs that blossom in the second, then actually resolved all of the dangling plot threads by the end of the third. It's a most welcome approach that respects the audience's intelligence, and owes far more to such well-planned literary works as the 'Lord of the Rings' and 'Harry Potter' novels than the "let's just make this up as we go along" school of filmmaking more traditionally common to franchise films. If only George Lucas had followed the Raimi playbook when he conceived the 'Star Wars' prequels, we might never have been subjected to all that Midi-Chlordians business, or Jar Jar Binks. One phenomenon that the 'Spider-Man' films seem to share with many movie trilogies (including the original 'Star Wars' films) is that the second installment is the best of the bunch. Indeed, both critics and audiences widely agreed that 'Spider-Man 2' was the most exciting, most emotional and most enthralling of the series. Much like Luke Skywalker's struggle in the 'The Empire Strikes Back,' there is something particularly compelling about a hero when he's at his low point, after he's just learned some big painful truth about his past and seems to have lost it all. Then, just as screen fades to black, we're left salivating at how the third chapter will wrap it all up. In 'Spider-Man 2,' the web really gets tangled for Peter Parker, and the complications are so juicy that 'Spider-Man 3' could only pale in comparison. But never mind that. 'Spider-Man' is not only one of the best comic book adaptations ever to come out of Hollywood, but also the most cohesive. Sure, the first film is loaded down by a lot of exposition, while the third is overtaxed by too many villains and needless subplots, but these are minor quibbles. As a whole, the 'Spider-Man' trilogy is a great thrill ride -- a terrific evocation of an iconic character, and a surprisingly resonant experience that actually improves upon repeated viewings. What more could you ask for from a big-screen comic book series? Though Sam Raimi chose to work with a couple of different directors of photography on the trilogy (Bill Pope on episodes one and three, and Don Burgess on two), like the films themselves, the great thing about the visual look of the 'Spider-Man' films is its consistency. Raimi has fine-tuned a very graphical, bold style that serves as one of the connective tissues of the franchise, an observation that's only heightened watching all three of the films back-to-back on Blu-ray. Throw any of these discs in at random, and you'd be hard-pressed to tell the difference. Sony has mastered all three films in 1080p/AVC MPEG-4 video, with each getting their own BD-50 dual-layer disc (note that 'Spider-Man 3' does have some extras, though they are largely audio material and thus don't eat up too much space). 'Spider-Man' is of course the oldest of the three, and at times shows it. In particular, I didn't find colors to be quite as bold in the first film as they are in the later installments, and saturation can be quite intense, to the point where colors occasionally smear ever-so-slightly. The second and third flicks are much more solid, although as I wrote in my full-length review of the stand-alone 'Spider-Man 3' release (note that the disc contents are identical to the box set, including the transfer), all three films have a "hot" look, with whites blowing out, which dulls colors somewhat. This is most evident again on the first film, which looks a bit blander than the other two. In general, all three transfers deliver a level of depth and detail that is usually stellar. There are definitely sequences throughout the trilogy that can easily serve as demo material. Given my personal distaste for high-contrast transfers, I was most impressed by darker scenes in each film, which tend to feature more pleasing colors for a smoother, natural image. Shadow delineation is also excellent across all three films, with an impressive level of detail visible in even the dimmest interiors. Perhaps the most interesting visual distinction between the films is the gradual improvement in CGI effects. By far, the most distracting element of the first 'Spider-Man' for me is its over-reliance on "motion blur," which sometimes gives character movements (particularly in the action scenes) a very soft, unfocused quality. Having said all that, I don't want to give the impression that the first film (or the second) are necessarily bad presentations. Quite the contrary. The differences in color, contrast and sharpness are fairly subtle, and taken as a whole, this is an excellent set of transfers. I definitely feel that Raimi and company perfected the already impressive visual palette they introduced in the first film by the time they finished off the trilogy, so most of my nitpicks come down to the original source for each film. All in all, I think fans will be more than pleased with this set. The good news is that despite these inconsistencies, it's hard to imagine that they'll be recognized by the average ear. I certainly was never distracted (or even reminded) while watching 'Spider-Man' that I was listening to a "lowly" 16-bit master. Instead, I was perfectly happy with the sound on all three films, and in fact found them to be largely stunning. The soundscape for the entire 'Spider-Man' trilogy has been beautifully produced and rendered. Clarity, and the palpable realism of the complete tonal range is first-rate. Predictably, low bass is a real shaker, with the subwoofer constantly active during all three flicks. As you would expect, there aren't any noticeable audible defects to the source elements. And for films with sound design as pounding as this, I was especially pleased to note that dialogue was never overpowered. Attention to the smallest detail is evident in these mixes, with impact never sacrificed, even in the quietest scenes. 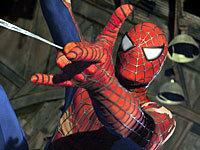 Of course, the primary sonic appeal of the 'Spider-Man' flicks is their immersive, comic book quality. Sam Raimi has been widely praised for his creative camera moves, but he's rarely given credit for his equal attention to sound. As Spidey leaps all about, or as one of the trilogy's many villains stages yet another scene of mass destruction, the "wall of sound" effect is always in full force. The surrounds are like a character all their own -- discrete effects are highly active, with frequent and seamless pans between all channels that create a terrific, wholly believable 360-degree effect. One of the reasons the Spidey flicks have been so highly anticipated by Blu-ray fans is because they've always been an aural tour de force in theaters. Even though Sony has delivered somewhat inconsistent audio specs with this box set, the end result is a home theater experience that rivals the best reference-quality soundtracks you're likely to hear. In the only real misstep on an otherwise fine box set, Sony has dropped all supplements from 'Spider-Man' and 'Spider-Man 2.' Sure, they've packed the full two-disc set version of 'Spider-Man 3' into the box, but that only makes the whole package feel even more lopsided. The move is particularly surprising given that earlier standard-def DVD versions of 'Spider-Man' and 'Spider-Man 2' came loaded with extras, so there was certainly a library of bonus material to pull fun. Let's start on disc one with the audio commentaries, of which there are two. First up, Sam Raimi is joined by Tobey Maguire, Kirsten Dunst, James Franco, Topher Grace, Bryce Dallas Howard and Thomas Hayden Church for one heck of a big group hug. This is certainly up there with the best cast tracks I've heard on any disc format, even going back to the laserdisc days. Unlike those spliced-together tracks (where the editors just rip the audio portion off a bunch of EPK interviews and call it a commentary), this one is all live (albeit with some of the cast beamed in by phone). Franco and Church in particular are articulate and passionate, prompting Raimi with all sorts of questions about the story construction, character arcs, and staying consistent to all the various incarnations and origins of the Spider-Man comic. Simply put, this track kept me riveted. By comparison, the second track feels lethargic. Producers Avi Arad, Grant Curtis and Laura Ziskin are joined by editor Bob Murawski and visual effects supervisor Scott Stokoyk, but unlike the cast track, this one has clearly been spliced together. Much of the discussion revolves around production nuts, but Ziskin and Arad also go into pretty lengthy detail on the gestation of the Sandman and Venom characters, and the balancing of the overflowing story elements. Raimi's presence is sorely missed here, however, making this track less than essential. Also included on disc one is a 6-minute reel of Bloopers, comprised of a series of missed lines, plus a goofy final montage of the cast making funny faces. For once, I'd love to see Maguire, unable to see though tin foil eyes, finally fall on his arse in the costume. No such luck. Next on disc one is a very nifty selection of Photo Galleries. This is one of the best-designed interfaces for a feature like this that I've seen yet. With just a flick of the button, you can easily toggle through the five sections -- "Director & Cast" (16 stills), "Paintings" (21 stills), "Sculptures" (10 stills), "Special Effects" (20 stills), "Sketches" (34 stills) -- then, once you're there, you can scroll through each of the images super-fast with the left and right arrow commands. There's even an optional "Slideshow" function for each gallery, which automates your viewing, complete with underscore. Very nicely done. Rounding out disc one is a music video for Snow Patrol's "Signal Fire," plus theatrical trailers for the Sony flicks 'Surf's Up,' 'Casino Royale,' 'Ghost Rider' and 'Across the Universe' (which, as I write this, has yet to be announced for Blu-ray). Moving onto disc two, we have the true centerpiece of the supplements. Sony has produced an excellent full-length documentary that, at 126 minutes, is almost as long as the feature film itself. Divided into thirteen chapters (kudos to Sony for allowing both direct access to each one as well as a "Play All" function), this one covers just about every element of the production you could hope for. Comprised of on-set and post-production interviews with every major cast and crew member, plus tons of behind-the-scenes and effects footage, the editing is razor-sharp. Though the very tech-sounding segment headings may not suggest it, the doc is actually quite well-rounded and linear, taking us on a guided tour of the main characters, through the inter-related story threads, through the editing and post-production. "Grains of Sand: Building a Sandman" (13 minutes), "Re-Imaging the Goblin" (11 min.) and "Covered in Black: Creating Venom" (16 min.) introduce us to the three main villains in the film, both from a story point of view as well as an effects perspective. The next five vignettes dissect the film's many action setpieces: "Hanging On: Gwen Stacy and the Collapsing Floor" (10 min. ), "Fighting, Flying and Driving: The Stunts" (19 min. ), "Wall of Water" (7 min. ), "Cleveland: The Chase on Euclid Avenue" (7 min.) and "New York: From Rooftops to Backstreets" (13 min.). It's here where all that behind-the-scenes footage really pays off. The 'Spider-Man' films have always been produced under a shroud of secrecy, with even a stolen, blurry snapshot posted on the web suddenly big news. Here, we finally get to see Spidey on the set, walking around and eating donuts. We also get a sense of the absolutely humongous size of the sets, locations and scope of the project -- if you're wondering how 'Spider-Man 3' could cost upwards of $250 million bucks to make, these chapters are a must-see. "Tangled Webs: The Love Triangles of 'Spider-Man 3' (9 min.) would seem like the odd one out, but it examines an underrated element of all the Spidey flicks -- their heart. Although I don't think 'Spider-Man 3' completely succeeds as a love story (it's too busy for that), as evidenced by "Tangled Webs," the effort certainly seems sincere. Wrapping up the doc are two post-production segments. "Inside the Editing Room" (4 min.) is an all-too-short visit with Raimi's long-time editor Bob Murawski, while "The Science of Sound" (16 min.) may seem like just another scoring featurette, but it actually offers something quite unique. Presented in what's billed as "optimized sound" (which is really just hard-encoded picture-in-picture video), this one shows a scoring session and the final film as a series of composited sequences. We also get an interview with composer Christopher Young, who does a clear and concise job of breaking down the key motifs and thematic elements of his score. Disc two concludes with a feature I'd love to see become standard on all next-gen releases. Rather than just giving us the film's theatrical trailer and maybe a teaser, Sony presents a complete Ad Campaign gallery. Included here are all three domestic theatrical trailers and the teaser for 'Spider-Man 3,' plus an International TV Spot compilation, featuring eight full-screen promos from various overseas territories. Truly great stuff. 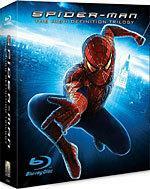 At last, the entire 'Spider-Man' trilogy has hit high-def, compiled in one convenient Blu-ray box set. This set certainly delivers on the bottom line, boasting strong video and reference-quality audio. The only major disappointment is a complete lack of extras for the first two films in the franchise. If extras aren't important to you, then by all means snap this one right up... but if you are waiting for the definitive Spidey box set on Blu-ray, I'm sorry to say that this one falls just short.